Children knew him as Kabuliwala. But they were afraid of him; he had such an imposing figure! 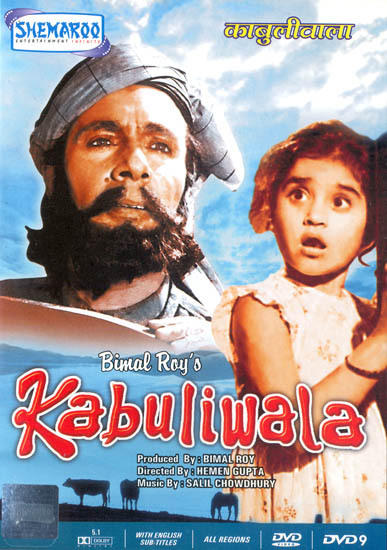 Like all good men, however, Kabuliwala was very fond of children. Often he would distribute his bagful of 'Pista Badam' among them. Kabuliwala had come to Calcutta to earn his living, leaving behind his little daughter. Her memory haunted him all the time. And he came across little Mini - the city child - in whom he saw the image of his own little daughter. Thus it was that Kabuliwala took to little Mini-like an affectionate father. In time a charming relationship developed between the two. At the call of Kabuliwala, the child would run down to him and outside the house in the garden, the little mischievous Mini and the giant Pathan could be heard talking, playing and laughing - forgetting the world around them. Fate, however, intervened and an unfortunate incident soon separated the two. They met again - but Kabuliwala had turned grey. His once youthful face reflected the march of time. And the little Mini had also grown up to be 'a young beautiful maiden-about to be married. Tagore's story KABULIWALA is so well known that perhaps you have read it. Here is a film based on that great classic. A brilliant adaptation by the legendary Bimal Roy!! !